It's Sunflower Season! 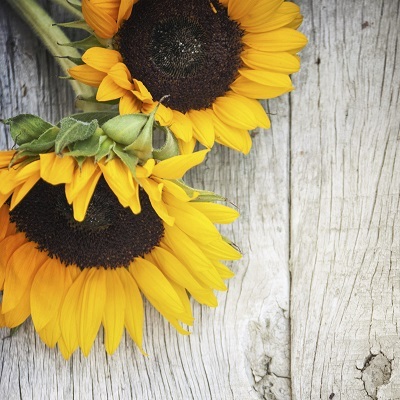 Did you know sunflowers are one of the fastest growing flowers in the world? That big flower is actually surrounding hundreds of teeny tiny flowers that turn into the seeds. Plant some in your garden and share with friends, family, or birds! Great for kids: Sunflowers are one of the fastest growing plants in the world, growing up to 1’ per day. They attract various insects and butterflies. Planting: Sunflowers need lots of sun. Sow seeds directly in the garden after the last frost in loose soil, about 2 inches deep, 1-2 ft apart. Water regularly and abundantly and mulch to conserve moisture. Harvesting: 90 days to fully grow. Let the sunflower dry on the plant as long as possible. Cover seed heads with netting or a pillowcase to prevent birds from stealing seeds. Seed Saving: When the backs of the flower heads are yellow and the bracts are brown, wait about 2 wks and then cut heads with 1 ft of stem. Spread facedown on cardboard and dry for another week. Lie them seed-side down on a sheet and gently beat the back of each seed head with a stick. Remove seeds and store in their kernels in a cool, dry place. Roasted for people and unroasted for birds. Toast the sunflower seed kernels in a large dry skillet over medium heat until golden brown, 5 to 7 minutes. While they are toasting, combine the sugar, 1/4 teaspoon of salt, and lemon zest in a small bowl. When the seeds are toasted, sprinkle the sugar mixture over the sunflower kernels. Stir until the sugar melts and coats them (your pan will need to be hot enough), usually about one minute. Transfer the kernels immediately to a plate so they don’t stick to the pan. Once they’ve cooled a bit, taste the kernels and season with a bit more salt, if needed. Let cool completely and then transfer any seeds you won’t be eating now to an airtight container.